It’s not everyday the maker of a movie sends you the DVD. After writing my review of Courageous, I received an email from Dr. David Evans, an eye doctor in Memphis. He said he had felt called to hire a movie crew and make a movie that he wrote, directed, and co-produced, and that he’d like to send me a copy. That movie was Grace Card. The funny part is that I’d seen a trailer for this movie on the Courageous DVD and thought, “Hey, I’d actually go rent that!” And the director sent me a copy for free! Woo hoo!! MPAA RATING: PG-13 for some violence and thematic elements. SUMMARY: After losing his child to a car accident, Officer Bill MacDonald (Mac), has been bitter and angry for years, hurting his job and his family. To correct his attitude, he’s partnered up with the one who took his promotion: Sam Wright. Sam is a black man struggling to start a church, but worried that this cop thing may be permanent. This union isn’t a jovial one, as Mac isn’t anything but Christian and isn’t the most accepting when it comes to race. When everything bottoms out, both Mac and Sam need to learn a lesson in grace, not only about how to give grace, but how to receive it. REVIEW: The best way to describe what I like about this movie is “Simple Storytelling.” The problem I have with Courageous and other such movies is that they use a message to tell a movie. 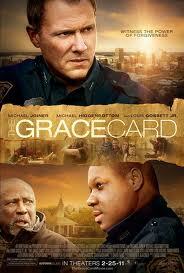 Grace Card uses a movie to tell the message. Nothing is hammered in or spoon-fed (or shoveled) in this film. A lesser film would have spent too much time focusing on the differences between the two cops, the poverty of the town, Mac’s anger, Sam’s ministry troubles, the importance of grace, and the titular Grace Card (more on that in a minute). This movie doesn’t do that. What does it do? It lets the story tell itself. It has confidence that the audience can figure out what’s right in front of them. Sam on left, Mac on right. The message is definitely there, and it’s very strong. However, again, the movie doesn’t sound like it’s trying to sell anything. It gives the message in good context. For example, the biggest moment is when Sam talks to his Grandpa George. George is immediately established as an old, retired preacher who has a high value in history and family, keeping pictures of Dr. King and memoirs from his family’s slave days (also another musing into race without drilling it in). All things considered, it makes sense than an old, family-driven, historical preacher would tell his grandson, also a pastor, the importance of grace, drawing on an old family story of a slave and his master. It fits the story. Even the Grace Card doesn’t appear until the last scene. The Grace Card is basically something you give to someone that says “I choose to love you no matter what you do to me.” This could have been the selling point, like the men’s commitment in Courageous. But no! Again, they let the story tell itself, not relying on a gimmick. Basically, this movie feels more like a piece of art than a message. It feels like an actual movie! There’s a real stress on the artistic merits like cinematography, acting, and storytelling. Does it always work? No, but often! Lighting techniques are notable, the drama is heavy without being hammy, the characters are sympathetic and realistic, and the narrative turn is good. One of the best points, though, is the sense of tension. You feel like you’re walking on eggshells in all the right places, like the counselor’s office, or when Mac is three seconds from exploding, or when someone nearly drops an N-Bomb (Christian movies are getting brave!). Acting is generally quite good, Mac outshining everybody. Bitterness is lined in his very face, and when he gets angry, it’s not in the stereotypical fashion, yelling at the kid to get out and never come back ,etc. Grandpa George is played by Academy-Award Winner Louis Gossett Jr., and it shows, as he gives some of the most human delivery in the movie. Sam’s acting is hit-and-not-quite-hit. He never truly misses, but it’s off sometimes. The rest of the cast is good and while not everybody shines, nobody is a fails terribly. So what DIDN’T work? Well, one character simply drops off the radar, there’s a memory montage that isn’t necessary towards the end, and the final scene has one hard-to-swallow problem. A character comes out of the shadows in the end and gives a speech that, while appropriate to the movie, felt way too scripted and forced. While it ruins the moment, it doesn’t ruin the movie or even the scene. The film is still a very strong one, very gritty, very real, lacking in all the shine and splendor a lot of Christian movies have. Better yet, it has the single most convincing redemption scene I’ve ever seen. No cheese, no Bible lessons, just two men and their God. I’m very grateful to Dr. David Evans for sending me this movie; it’s easily one of my favorite Christian films, if not my favorite. It’s solid movie making and shows that someone is finally concerned with making a movie, not just a message. Now if someone wants to send me a copy of To Save a Life, the trailer made that movie look awesome! LANGUAGE: 3/10–Not much, but at least one gets pretty close to an N-bomb. VIOLENCE: 6/10–A nasty gunshot wound at the climax with plenty of blood and some more blood in an earlier scene. No real fighting. SUBSTANCES: 2/10–Mac has a drink at a bar, nothing serious. MATURE THEMES: 7/10–Heavy themes of racism, several tense moments, definitely not for kids. Next > After a Week of Work, I can Finally Start! Definitely want to see this movie now. Well worded review.